I figured this would be the book that would make or break the series for me - the first book was fun, and original, but either Brandon Mull would get stuck in a rut and run out of new ideas, and become trite and run-of-the-mill, or he would pull another great story out of his mind with new ideas and more excitement. Turns out that not only did he pull it off, he did it with splendor. 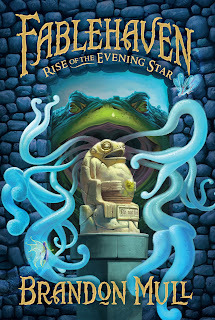 His original fantasy world is more believable, more rich, more complex and interconnected than I had hoped, with rich characters, interwoven plot threads, and a greater story than just the plot of each book, and yet each book stands alone as a great story too. I especially liked the inverted tower part of the book - I've had a recurring dream that I wanted to make into a story where I had to go up against evil creatures to overthrow the big bad guy at the end of several challenges, each more life threatening, and each deeper under ground in an inverted tower, and thought to myself that it would make a great story. Thanks, Brandon Mull, for writing the story for me! As far as the audiobook is concerned, the reader's performance leaves less to be desired than the first book - more voices, more characters, more accents, and less overblown enthusiasm. If you're not hooked on the series after the first book, you should be after this one. I think it's great. 9 out of 10 all around!